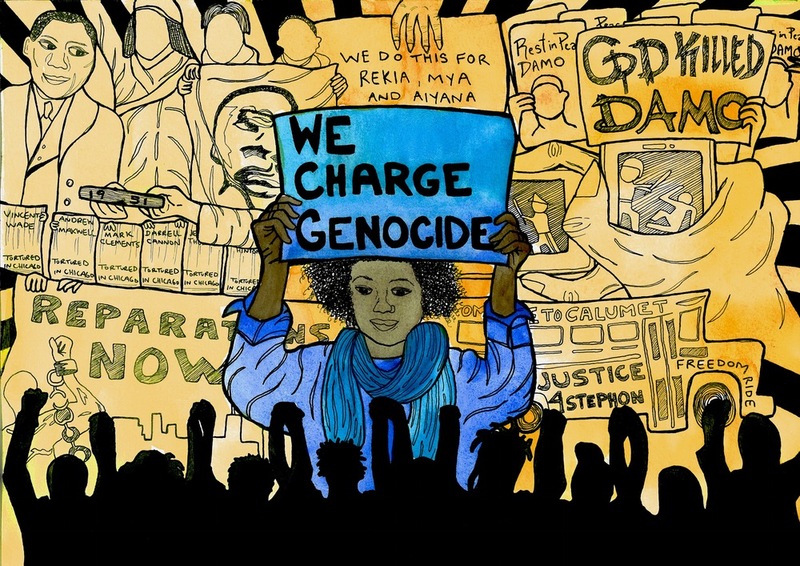 Image: “2015, We Charge Genocide: Year 1,” by Monica Trinidad (www.monicatrinidad.com). I lived in South Africa during the 1990s, a period of transition from apartheid to some form of democracy. During this restructuring, much of the political debate centered on compensation for the violence and inequity of the past. With the rise of the Movement for Black Lives and other anti-racist groups in the US today, those debates reverberate through current politics, in particular in regard to the major focus of my own social justice work, mass incarceration. One method that has gained increasing traction as a way to contest dominant power is storytelling. Indeed, the stories of individuals impacted by imprisonment or police violence often provide the inspiration that keeps us going. The brave words of the daughter of Eric Garner standing up for justice steel our own determination to act. The personal testimony of Darrell Cannon, who was tortured by Chicago police into confessing to a murder he did not commit, has touched me deeply on the several occasions I have heard him speak. Cannon spent 24 years in prison as a result, about a decade of them in solitary in the notorious Tamms supermax facility. Perhaps the South African Truth and Reconciliation Commission (TRC) provides the greatest English-language example of the use of storytelling to both recreate a historical narrative and lift up the voices of the victimized. Over the course of three years, the TRC held dozens of hearings around the country where victims of police torture and state violence told their stories. In cities and towns across the country, mothers came forward and talked about how their sons had gone missing; young women reported sexual assaults by members of the defense forces; some survivors spoke of having desk drawers slammed shut on their testicles, of being subjected to a South African version of water boarding, of watching family members murdered in front of them. Many of the hearings were on live national TV, and nightly news provided frequent updates. These broadcasts not only gave voice to the previously unheard, but often put perpetrators on screen. Torturers like Eugene DeKock, nicknamed “Prime Evil,” and Jeff Benzien sat in hearings as their most heinous acts were described in detail. Ultimately the TRC had an enormous impact on the popular understanding of the apartheid years, giving presence to the experiences of the victims and survivors and naming the names (and in some cases prosecuting) the perpetrators. In this regard, the TRC was a public process of attempting to heal wounds through truth-telling and reconciliation. Nonetheless, 20 years later the TRC process looks somewhat barren: the stories and prosecutions were not backed up by the reallocation of resources to address poverty and inequality. Although a few people did benefit financially from the TRC, the society remains more unequal today than it was at the end of apartheid. In particular, the South African TRC never paid significant attention to extracting confessions and compensation from the mining and industrial corporations that oppressed cheap Black laborers to amass profits during the apartheid years. Hence, telling stories can empower people but can also be used to placate the survivors. The family of famed Black South African leader Steve Biko refused to participate in the TRC, arguing that it merely served “political expediency” and denied justice for victims. To be truly transformational, such truth-telling must be combined with a fundamental restructuring of the political economy. This restructuring must benefit the poorest sections of the working class while remaking the physical and social infrastructure of their communities. The old streets merely populated by monuments and parks named after fallen heroes are not enough. At present a number of US initiatives directed at the contemporary criminal justice system are grappling with similar issues to those tackled by the TRC. In fact, Dr. Mutulu Shakur, a political prisoner for more than two decades, has proposed a TRC to address the historical oppression of Black people in the US. Perhaps some version of this that included both truth-telling and punishment of the architects and benefactors of mass incarceration could provide some impetus for transformation. Several attempts to link this to redistribution have been made under the heading of Justice Reinvestment. Following this principle, decarceration and cutting of corrections spending should be paired with the reinvestment of the money saved into the communities that have been affected by police and judicial abuse. One of the most interesting of these initiatives is the Truth and Reinvestment program recently begun by the Ella Baker Center in Oakland. Truth and Reinvestment focuses largely on redefining the nature of public safety, aiming to “build safe communities where public resources are reinvested from a wasteful criminal legal system to long-term solutions.” Though still in its early stages, Truth and Reinvestment offers the opportunity to expose police and criminal justice abuse while diverting funds into positive community building. Perhaps activists in Chicago have had the most success in linking truth-telling to reinvestment. Groups fighting police torture in Chicago adapted the term “reparations,” which has been mostly applied to the enslavement of people of African descent, to their own situation. In a campaign that lasted over two decades, a constellation of grassroots organizations, torture survivors, and legal experts won a complicated series of victories and a multifaceted set of reparations. The main focus of their actions was initially to gain compensation for survivors like Darrell Cannon as well as to instigate some kind of legal prosecution of police torturers. In 2010 they won a key legal victory, securing the indictment and eventual incarceration of Detective Jon Burge, alleged to have orchestrated or carried out the torture of about 120 people, almost all of them Black men, whose fate mirrored that of Cannon—decades in prison, often in solitary, for crimes they did not commit. The campaign won payouts for some of the survivors as well. But ultimately, the campaign was not limited to legal concessions. Rather, in 2014, as the mobilization of anti-racist forces grew, the vision of the Chicago Torture Justice Memorials activists and their grassroots allies—Project NIA, We Charge Genocide, and BYP 100—expanded to include public education, benefits for family members of survivors, and a formal ordinance from the city council acknowledging the wrongdoing of the police. The ordinance ultimately included a promise by the city to build a memorial to torture victims and the mandatory inclusion of the history of police torture in local school curricula. These gains were won because of the imagination and militancy of the people on the ground, especially Black youth post-2014. Perhaps the highlight of this process was the visit to Geneva by the We Charge Genocide group, where they presented the case of Chicago. They walked in the historical footsteps of a 1951 delegation of African Americans who presented the case exposing Black genocide in the US at that time. Having born witness to both the South African TRC and the Chicago Reparations campaign, I think it is important to recognize that storytelling is a necessary but not sufficient step in pressing for transformation. Storytelling lights the fire, but the flames only keep burning if there is effective mobilization and participation from those directly affected and a clear-cut, realistic, and flexible plan for success. In South Africa, there was little follow up to a massive storytelling exercise. In Chicago, albeit on a much smaller scale, the stories of the survivors inspired organization and a creative set of demands that will have a lasting impact. Still, though some reparations have been won, the major portion of the economic pie remains in the hands of Mayor Rahm and his ruling class circle. A much bigger round of reparations will be necessary to fundamentally reshape Chicago and all the other communities that have been devastated by police violence and mass incarceration. * James Kilgore is an activist, educator and writer based in Urbana, Illinois. He is the author of four novels, all drafted during his six and a half years in federal and state prisons in California. He has written widely on mass incarceration as well as on the struggle for freedom in South Africa, where he lived for eleven years. His most recent works are Sister Mercy’s Revenge (politically charged crime fiction) and Understanding Mass Incarceration: A People’s Guide to the Key Civil Rights Struggle of Our Time. Contact him @waazn1 or waazn1@gmail.com.